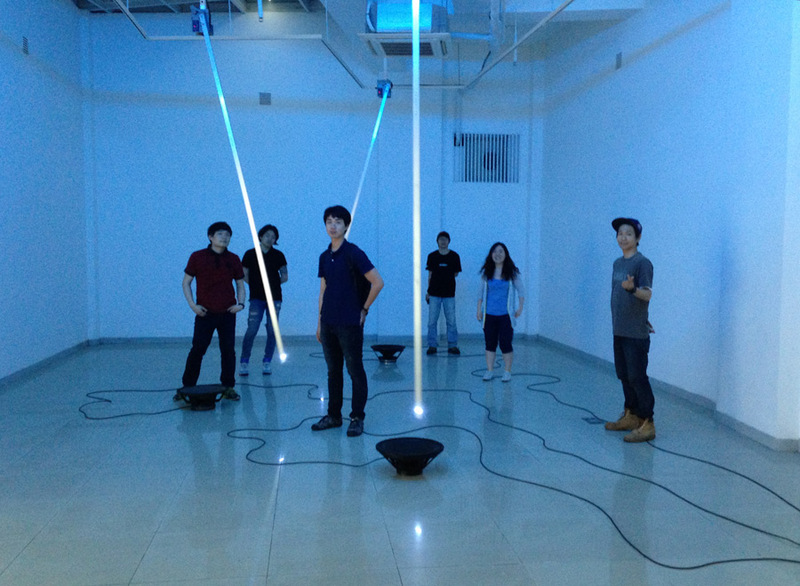 ● The media installation < The Breath of the Sea > was initiated with the experience that I encountered long time ago. 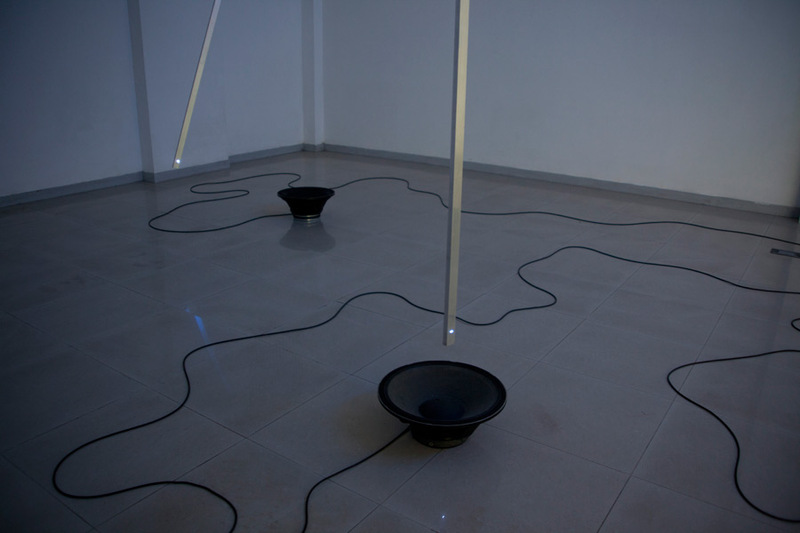 It was a scene that a microphone, which is connected its end to a portable outdoor speaker with a long line of cable, was kept in moving back and forth from the speaker just like a pendulum. Also, since two devices-a microphone and a speaker- created a closed feedback loop, I could hear a kind of noises created between the two. Interestingly enough, however, the noise sounds just like the sound of the ocean waves at that time. 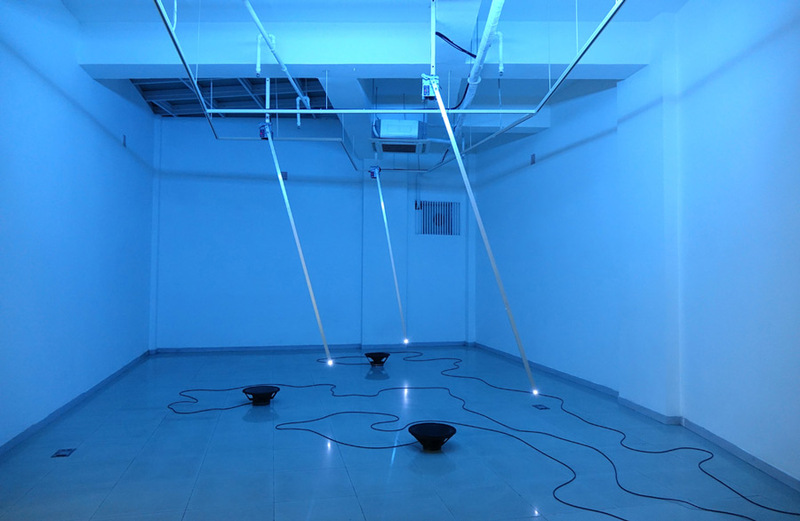 After this experience, the project idea of sea waves fulfilling the empty space, only with a speaker on a floor and the microphone hanged under the ceiling just like a pendulum was conveyed. 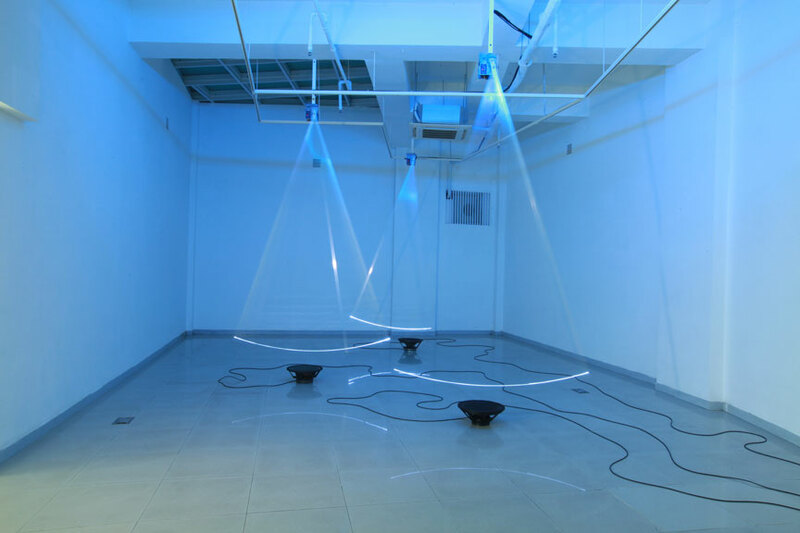 With this idea, I want to think of how electrical and electrical feedback can be linked to the feedback in the nature; I think the wave movement is a kind of interaction between winds and water, as well as one of feedbacks between the tides such as ebb and flood. 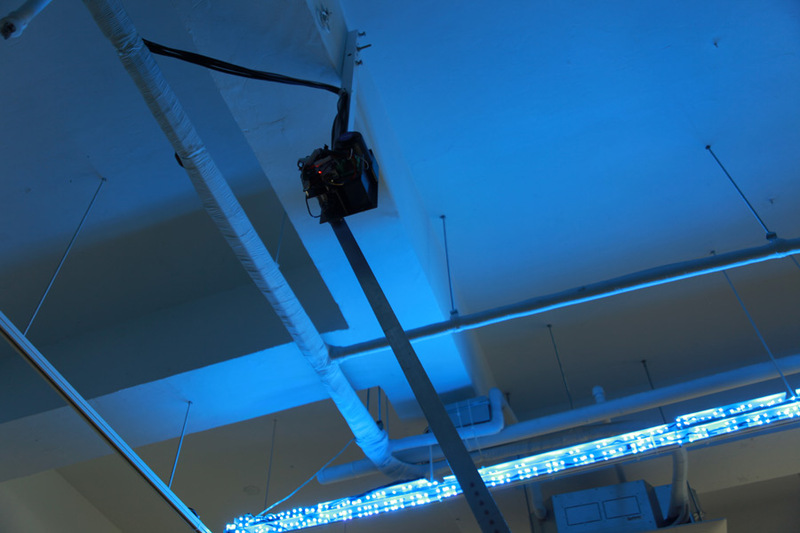 The machinery pendulum repeats its movement between left and right controlled by a geared motor. 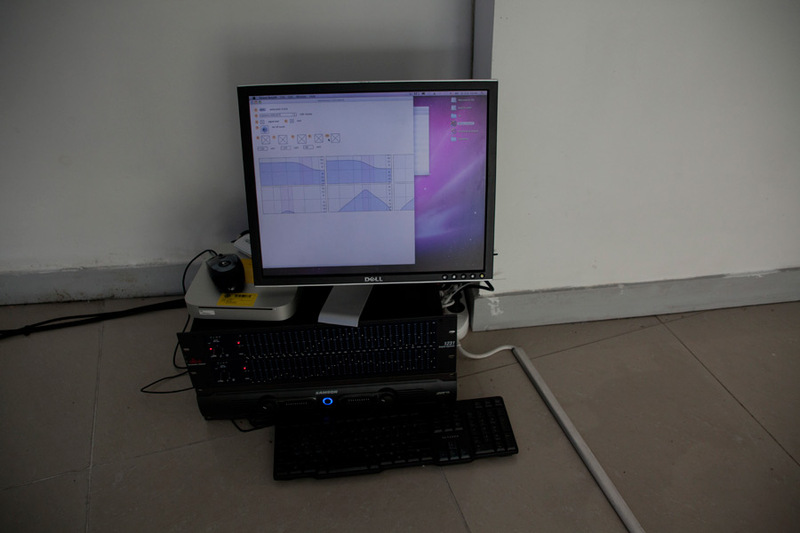 Depending on the movement of each pendulum, the current states of each pendulum's time interval for returning back to the same position (speed) and the directional change and position are detected by a sensor and delivered to the computer running Max/MSP via Arduino. Then finally the computer creates the sound of layered waves simply from pure machine-generating pink noises. 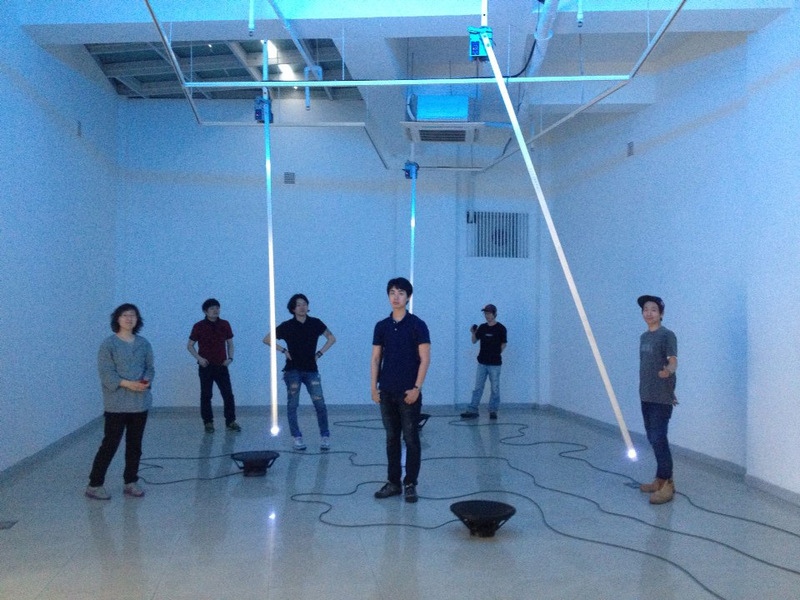 Therefore, machine-making sounds are transformed to the very sound in the nature. 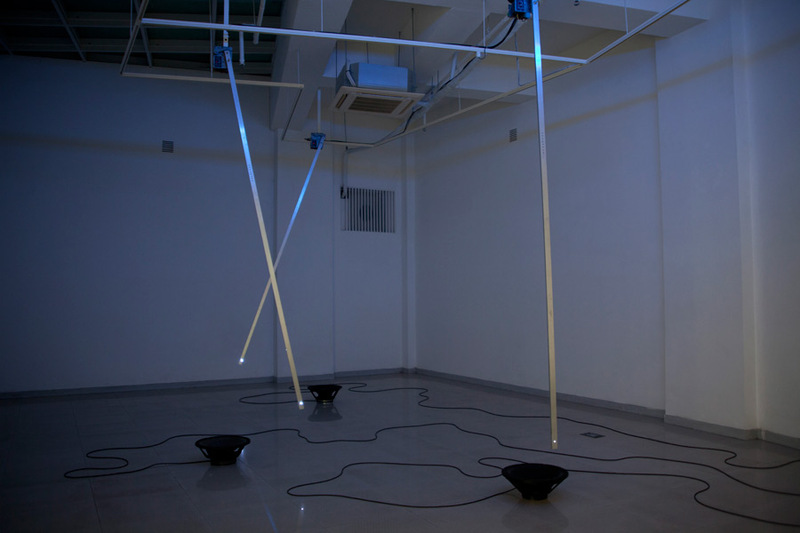 Fulfilling the sound of wave in the empty gallery space, this work suggests its audiences to think of how the breath of the machine can be similar or take after the breath of the nature. ●「바다의 숨소리」라고 하는 작업은 오래 전 우연하게 마주했던 경험에서 출발한 작품이다. 바닥에 놓인 행사용 스피커 주변을 줄 끝에 늘어진 마이크가 닿았다 떨어졌다를 반복하는 상황을 목격하게 되었는데, 이 때 기계적 피드백룹에 의한 노이즈가 만들어졌고 이것이 신기하게도 마치 파도소리와 같이 들렸던 경험이었다. 그 후 오랫동안 빈 방 바닥에는 스피커가 덩그러니 놓여있으며 천정에서부터 내려온 마이크가 진자처럼 움직임을 반복하며 호흡하는 듯 파도소리가 방안을 가득 메우는 사운드 설치 작업을 머릿속에서 구상하였다. 기계적 피드백이 마치 자연적 피드백으로 연결되는 상황을 구성하고자 한 것이다. 진자운동은 마치 파도가 들어오고 나가는 것처럼 앞뒤로 움직임을 반복한다. 또한 이에 따라 파도가 생기고 부딫치고 떠나가는 소리가 반복된다. 텅 빈 미술관 공간에서 파도소리, 바다의 숨소리를 채워본다. 기계의 호흡과 자연의 호흡이 얼마만큼 닮아 있을까? 진자운동이 여럿 반복되어 겹치지며 바다 한 가운데 파도의 겹처럼 느껴질 수 있을까? 무심하게 끊임없이 반복되는 파도를 공간 가득 그려본다. ● P.S. 「바다의 숨소리」에 대한 본격적인 작업을 하는 동안인 2014년 4월.. 그 기간은 내내 세월호 사건으로 매체를 통해 팽목항 바다를 바라보게 된 기간이었다. 바람이 강하고 파도가 높아 실종자를 수색하는데 어려움이 있음을 보도하며 미디어는 연일 어린 목숨들이 행여 바다 속에 생존하고 있을까, 바다 속에 혹시 모를 생존자들이 숨쉴 수 있는 가능성의 공간, 공기주머니(air pocket)가 과연 있을 것인가 등에 대하여 연일 논하였다. '바다의 숨소리'라는 제목으로 작업을 하며 애초에 시원하며 때때로 매우 낭만적인 파도 소리를 머릿 속에 그리고 있었으나, 연일 너무나 큰 슬픔 앞에 거대하고 무자비하고 냉정하게 들리는 바다의 숨소리만을 듣고 있는 듯 하였다. 그리고 엄마의 뱃속에서 탯줄과 연결된 태아가 숨쉬는 것과 같이, 바다가 정말 생존자들의 호흡과 연결될 수 있는 숨소리를 가졌으면 하는 생각도 하였다. 결국 그들의 호흡은 더 이상 가능하지 않았다. 바다의 숨소리가 그들의 숨소리를 대신하여 서글프게 들린다. 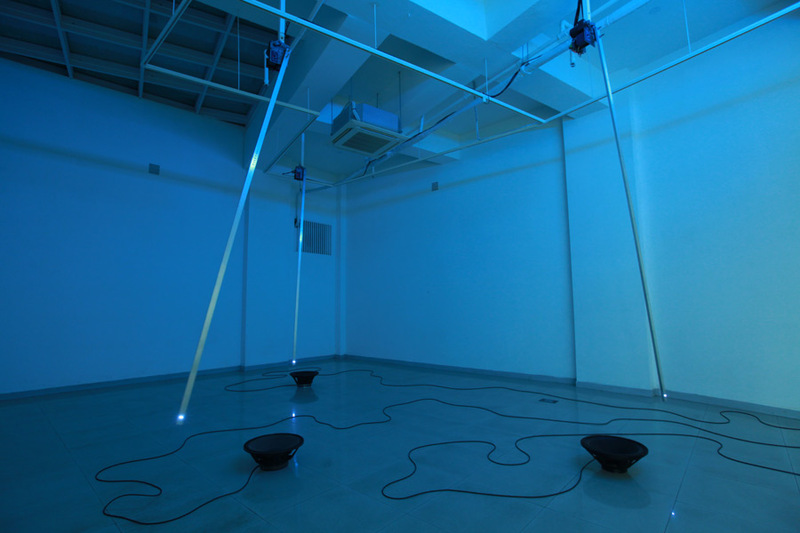 This work is across the following categories: the Software art, Generative art, Robotic, Data Visualization & Mapping, and sound installation. 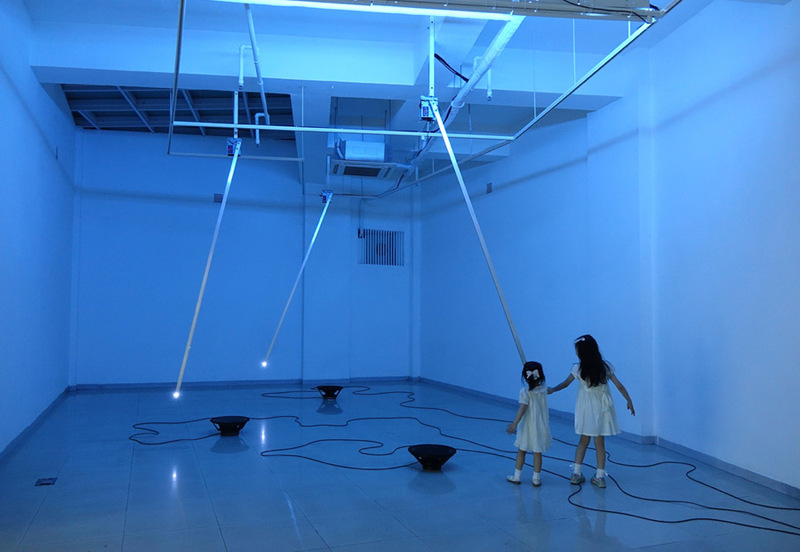 installed at "Hyun Jean Lee's 4th Solo Exhibition entitled 'Deep Breathing'"